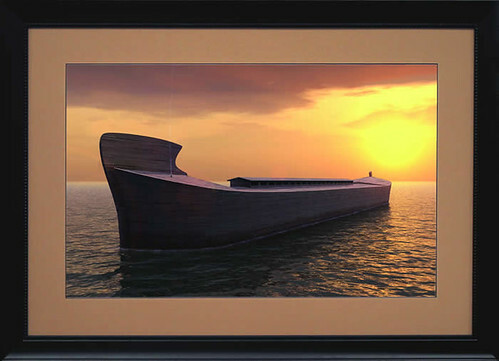 God spoke with Noah when He told him to come into the ark. (See post on Genesis 7:1-5) After that, we have no record of God speaking with Noah for another three hundred and seventy-seven days. Just last night I learned the story of Temple Grandin. By the time she was four years old she still hadn’t spoken her first word at which point doctors diagnosed her with autism. Temple’s mother, Eustacia, was told that she may never speak at all. Her doctors recommended that Temple be institutionalized. Eustacia was completely flooded with confusion and doubt. What had gone wrong? She had another child that was completely normal. How could she possibly cope with all that came with having an autistic child? Temple’s mother decided on a different course of action from that recommended by the doctors. She decided to work with Temple herself, at home, on the basics: learning words, learning manners, being in the same room with people. Anyone who’s life has been touched by someone with autism knows that this is an incredibly tedious grind. In Temple’s case this travail lasted for years and years. Had God forgotten about Temple Grandin? After years of hard work Temple was eventually able to attend school. School was painful, Temple was often ridiculed for her awkward way with people. But while in school it was discovered that Temple’s mind worked in pictures which in turn, led to the discovery of special abilities with spatial perception and mechanical design. Temple Grandin could do things that ordinary people couldn’t do. Incredibly she went to college and received her Bachelors degree from Franklin Pierce College, her Masters from Arizona State, and her Doctorate from the University of Illinois. On her aunt’s ranch it was discovered that in addition to her mechanical design abilities she also had a knack for working with livestock. Combining these gifts she published articles in ranching magazines and eventually published a book titled Using the Mysteries of Autism to Decode Animal Behavior. Today McDonalds and several other of the largest processors of beef in the United States use Temple Grandin’s designs in their processing plants. Today Temple Grandin is an associate professor of animal science at Colorado State University. Is your world flooded with problems right now? Flooded with debt? Flooded with illness? Flooded with heartbreak? Has it been three hundred and seventy-seven days since you’ve heard from the Lord? Are you starting to wonder if God has forgotten about you? Listen, God will never forget about you. The same God who loves you so much that He sent His only Son to be tortured for you, to die for you, is the same God who will never forget you. It’s not rational for an omniscient God who has gone to the extreme of sacrificing what’s most dear to him on your behalf to forget you. It doesn’t matter if you think you haven’t heard from Him in three hundred and seventy-seven days, three hundred and seventy-seven weeks, or three hundred and seventy-seven months, He won’t forget you. He can’t forget you. He loves you too much. And just as He was with Noah, He wants His very best for you. …we also glory in our sufferings, because we know that suffering produces perseverance; perseverance, character; and character, hope. This entry was posted in Bible Study, Genesis and tagged But God remembered Noah and all the wild animals and the livestock that were with him in the ark and he sent a wind over the earth and the waters receded, Genesis, Genesis 8, Genesis 8:1, God remembered, Jesus, Jesus Christ, Romans 5, Romans 5:3-4, Temple Grandin, we also glory in our sufferings because we know that suffering produces perseverance perseverance character and character hope by Kurt Bennett. Bookmark the permalink.